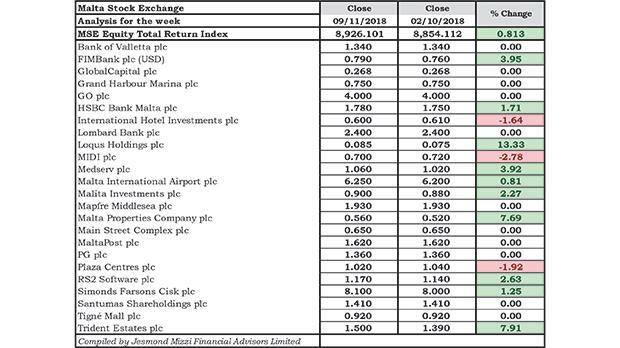 The MSE Equity Total Return Index partially recouped the previous week’s 0.852 per cent loss, having advanced by 0.813 per cent, to close at 8,926.101 points. Turnover amounted to €2.5 million, spread across 20 equities, of which three fell and 10 gained ground. Trident Estates plc shares rallied by 7.9 per cent as 36,047 shares changed ownership across nine trades, closing €0.11 higher at €1.50 – a 24-week high. Meanwhile, Malta Properties Company plc shares partially erased the previous week’s 8.8 per cent loss, having appreciated by €0.04, or 7.7 per cent. The equity was active on 11 transactions of 131,610 shares and closed at €0.56. In the same sector, MIDI plc shares fell by 2.8 per cent over 21 deals of 225,386 shares, closing at €0.70. Meanwhile, Malita Investments plc shares advanced by 2.3 per cent across 12 transactions of 148,800 shares, to close at €0.90. Malta International Airport plc shares increased by 0.8 per cent over the highest turnover for the week, worth €463K, to close €0.05 higher at €6.25. Last Wednesday, the local airport operator published the traffic results for the month of October, registering a total of 646,559 passenger movements, translating to an 8.4 per cent increase over the same month last year. This shows that the airport is on track to reaching its forecasted 6.8 million passenger movements by the end of 2018, as it is currently just short of the 6 million mark. The summer period, spanning from April to October, concluded with a 12.2 per cent overall growth in passenger numbers. This was in line with a 13.4 per cent increase in aircraft movements and a 13.7 per cent increase in seat capacity, as a result of a significantly enhanced summer schedule. The top drivers for passenger traffic were the United Kingdom, Italy, Germany and France, while Spain recorded an impressive 44.5 per cent growth, following the launch of three new summer routes. FIMBank plc shares advanced by 4 per cent across 16 transactions of 348,100 shares, closing at $0.79. Bank of Valletta plc shares closed unchanged at €1.34, after having registered a decline for six consecutive weeks. The banking equity witnessed 45 deals of 180,249 shares. Meanwhile, HSBC Bank Malta plc (HSBC) shares increased by €0.03 or 1.7 per cent as 132,703 shares changed ownership over 13 trades, closing at €1.78. Last Friday, HSBC published its Interim Directors’ statement in which it reported the bank’s performance for the first nine months of 2018. In line with the interim results, profit before tax for the period declined compared to the previous year. Revenue for the period was lower, as a result of the persisting low interest rate environment, a reduction in the corporate loan book, and the various risk management actions taken during 2017. Meanwhile, operating expenses were higher due to investments in regulatory programmes combatting financial crime and business growth. The bank report that its liquidity position remained exceptionally strong and the regulatory capital ratios continue to exceed regulatory capital requirements. The bank’s CEO, Andrew Beane, said that the quarter’s results are in line with expectations and the bank’s improved risk management is now enabling greater focus on growth. Lombard Bank Malta plc announced that further to its previous announcements, it has been notified by the National Development and Social Fund (NDSF) of Malta, of its firm intention to dispose of all or part of its shareholding in the Bank and to commence the process for the disposal in an orderly manner. The NDSF informed the Bank that the completion of the disposal shall be conditional and dependent on market conditions, regulatory approvals and other conditions which are currently being evaluated by the NDSF. The NDSF holds 21,651,746 ordinary shares in the issued share capital of the Bank representing 49.01 per cent of the total issued share capital of the Bank. International Hotel Investments plc (IHI) shares fell by 1.6 per cent across 13 deals of 115,432 shares, closing at €0.60. The investments and insurance services provider, Mapfre Middlesea plc, registered no change in its €1.93 share price, as three trades of just 583 shares were concluded. Loqus Holdings plc shares stayed faithful to their recent winning streak, having registered an increase for the fourth consecutive week. The IT equity advanced by 13.3 per cent, and was active on two transactions of 4,000 shares, closing at €0.085 – a two-month high. RS2 Software plc shares increased by 2.6 per cent over 14 deals of 115,107 shares, to close €0.03 higher at €1.17. The food and beverage supplier, Simonds Farsons Cisk plc, recorded a €0.10 or 1.3 per cent gain in its share price. The equity was executed across five trades of 33,667 shares and closed at €8.10. GO plc shares oscillated between a weekly high of €4.08 and a low of €3.98, but ultimately closed unchanged at €4. The telecommunications services provider witnessed 13 transactions of 18,486 shares. The oil and gas logistics services provider, Medserv plc, registered a 3.9 per cent increase in its share price, as 10 deals of 80,200 shares were negotiated, to close €0.04 higher at €1.06. Tigne Mall plc shares closed unchanged at €0.92, as nine trades of 100,000 shares were concluded. Meanwhile, Main Street Complex plc shares remained at the €0.65 price level for the fourth consecutive week. The equity was negotiated across two deals of 222,329 shares. In the same sector, Plaza Centres plc shares fell by 1.9 per cent over three transactions of 35,000 shares, closing at €1.02. Santumas Shareholdings plc shares closed unchanged at €1.41, despite having traded at a weekly low of €1.35. The equity was negotiated across five trades of 17,135 shares. The retail and supermarkets owner PG plc¸ recorded no change in its €1.36 share price, as two deals of a mere 2,450 shares were concluded. In the corporate bond market, 41 issues were active, of which 15 advanced, while 16 declined. Turnover more than doubled, having amounted to €2.4 million. The 3.75% Premier Capital plc Unsecured € 2026 headed the list of gainers, having increased by 3 per cent as nine deals worth €134,874 were negotiated, closing at €104. Meanwhile, the 4% IHI Secured € 2026 was the worst performer, having slipped by 1.1 per cent across 19 trades worth €222,925, to close at €104.10. The 4.25% GAP Group plc Secured € 2023 was the most heavily traded bond, having witnessed €330,195 turnover, to close 0.4 per cent higher, at €105. Investors shied away from the sovereign debt market, as out of 21 active issues, 17 lost ground and only two closed higher. Turnover totalled to €3.6 million – compared to €4.2 million in the previous week. The 2.1% MGS 2039 (I) was the top performer and the most liquid, having advanced by 0.5 per cent on a turnover of €2 million, to close at €102. Meanwhile, the 4.5% MGS 2028 (II) was the other gainer, having increased by 0.3 per cent on five trades worth €121,629, closing at €127.70. The long-dated 2.4% MGS 2041 (I) registered the biggest loss of 0.8 per cent to close at €104.40 – as eight trades worth €139,629 were registered. This article which was compiled by Jesmond Mizzi Financial Advisors Limited, does not intend to give investment advice and the contents therein should not be construed as such. The company is licensed to conduct investment services by the MFSA and is a member of the Malta Stock Exchange and the Atlas Group. The directors or related parties, including the company, and their clients are likely to have an interest in securities mentioned in this article. For further information contact Jesmond Mizzi Financial Advisors Limited at 67, Level 3, South Street, Valletta, or on Tel: 21224410, or email info@jesmondmizzi.com.